M.T. Outlaw’s new book “Discovering Yesterday” is a poignant story of a man’s mysterious past that unexpectedly haunts him. 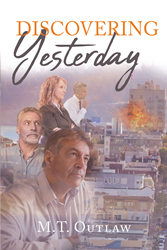 Recent release “Discovering Yesterday” from Page Publishing author M.T. Outlaw is a harrowing tale of a man’s journey toward rediscovering his life’s weaknesses and a lesson on acceptance. M.T. Outlaw, a professor, writer, and consultant in the state of Hawaii, has completed his new book “Discovering Yesterday”: a gripping account of a man’s recollection of painful moments that truly defines his character. Published by New York City-based Page Publishing, M.T. Outlaw’s evoking account exudes with riveting perspectives that reflect life’s magnanimity and grace. Readers who wish to experience this astounding work can purchase “Discovering Yesterday” at bookstores everywhere, or online at the Apple iTunes store, Amazon, Google Play, or Barnes and Noble.